The sinuses are air-filled cavities in our skulls. They are important for a couple of reasons. For one thing, they help warm and humidify the air we breathe in through our nose. For another thing, they make our skulls lighter; if those sinus cavities were solid bone we would have a much heavier weight to carry around on our shoulders. 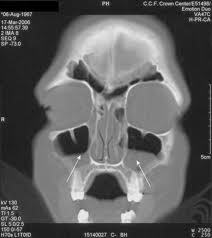 There are several sinus cavities in the skull, as you can see in the figure below. The image is from a CT (computed tomography) scan of a person’s skull. The CT is a kind of x-ray, in which bone is white, air is black, and solid tissues are shades of gray. CT images come in “cuts,” which show sequential slices through the skull. Each cut is about a quarter inch wide. This one is through the skull just behind the nose, with the person looking right at you. The blackness shows that the sinuses are filled with air as they should be. The sinuses don’t all develop at the same time. A baby is born with ethmoid and small maxillary sinuses, with the frontal sinuses over the eyebrows developing by age eight or so. The sinuses have tiny openings into the nasal passages. They represent one of the areas in the body (the entrance to the lung is another example) where a sterile area, one free of bacteria, is in very close proximity to an area heavily colonized by bacteria. In this case the normally sterile sinuses are connected via a passageway to the nasal passages, which are loaded with bacteria. When bacteria manage to invade a sinus, they cause a condition called acute bacterial sinusitis, or just sinusitis for short. 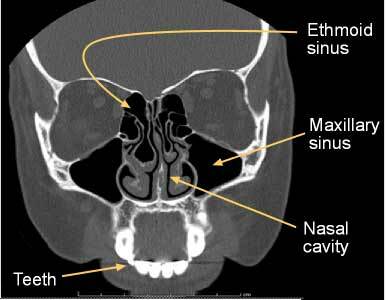 The CT image below shows what that looks like: the arrows show fluid layered in the sinuses, which should be completely black with only air. The scan also shows the nasal tissues in the middle to be quite swollen compared to the normal image above. How does it happen? Virtually all cases of bacterial sinusitis begin with a viral upper respiratory infection — a common cold. The effects of a viral infection on the lining of the nose, which is what we term respiratory epithelium, is to stun the normal function of the tissue. The respiratory epithelium normally does a good job keeping debris, including microorganisms, out of the sinuses. It does this in a couple of ways. It secretes mucous in modest amounts, which entraps invaders. It then moves this mucous out by an ingenious mechanism. Respiratory epithelium is covered with a fine blanket of what are called cilia, microscopic structures that look like long fronds of kelp rising from the ocean floor. The cilia wave back in forth in unison, which moves the mucous along out of the sinuses and down the nose like a conveyer belt. A cold increases mucous production dramatically and also interferes with cilia function. The key thing is that virtually all colds cause inflammation of the sinuses. But that inflammation should be gone by ten days. If it isn’t, bacterial sinusitis is usually present. Most experts recommend antibiotic treatment at this point. Although x-rays or CT scans are often done, the current consensus is that they aren’t needed unless treatment fails to resolve the symptoms. For children, the current recommendation for the best antibiotic is amoxicillin or amoxicillin/clavulonate (brand name Augmentin), usually for ten to fourteen days. The choice depends upon local patterns in antibiotic resistance among bacteria. Of note, decongestants, such as antihistamines like diphenhydramine (brand name Benadryl), don’t help. These are the most current expert recommendations. You can read more about acute sinusitis and its treatment here, a summary paper published by the Infectious Diseases Society of America. It has a nice flow chart on page two.